Roll up, roll up! Get your goods here! We’ve got toys, drums and accordions! Today only we have special offers on mirrors, cheese and… um… raccoons? 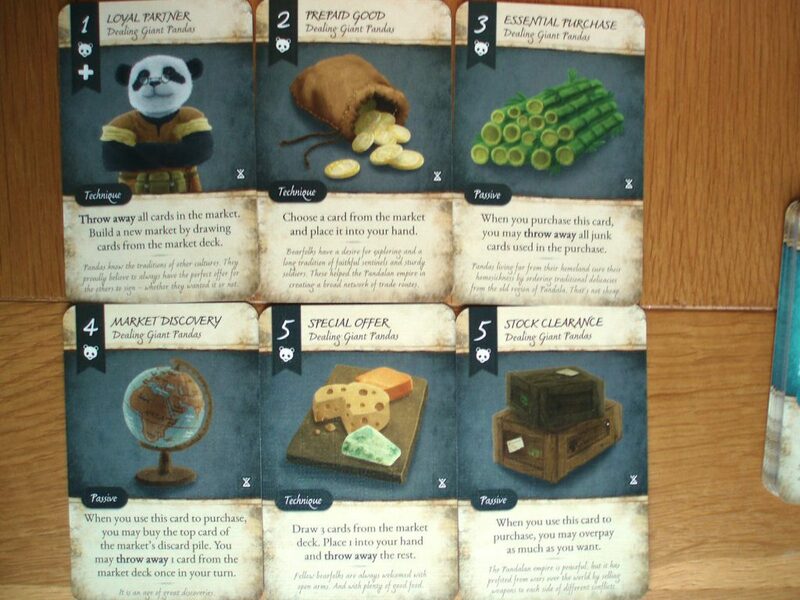 Welcome to Dale of Merchants, the first game set in the animal world of Daimyria. 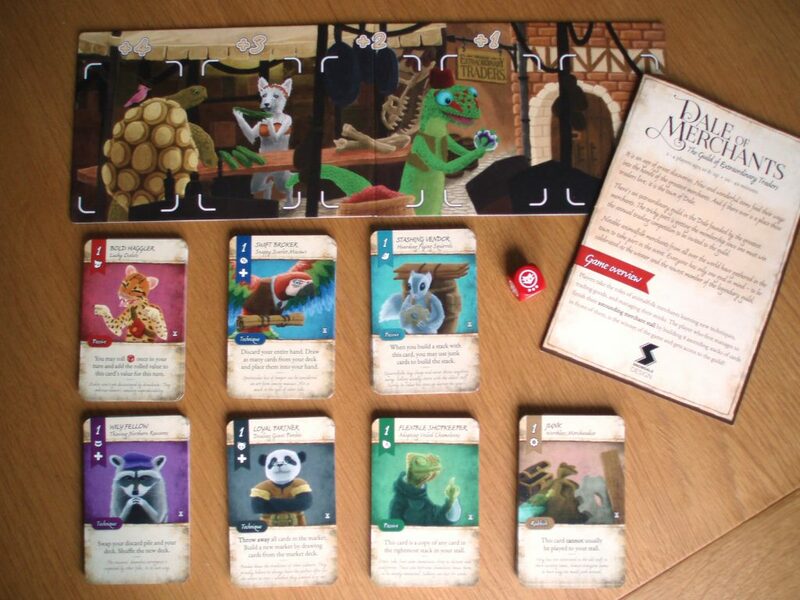 In this 2-4 player card game from 2015 players are animal-folk competing to join the Extraordinary Guild of Traders. Dale of Merchants involves deckbuilding, a hugely popular mechanic established in 2008 by Dominion. For those unfamiliar, in deckbuilding games each player begins with their own personal deck of cards. Over the course of a game players add to and tweak their decks, making them more effective in order to achieve the game’s ultimate goal, anything from collecting subatomic victory points to silently moving around a dungeon. Yet most deck builders barely alter Dominion’s original core mechanics and many are simply just re-themes. Here’s where Dale of Merchants stands apart: the designer Sami Laakso has switched up both the goals and the game mechanics to produce something novel yet familiar. Let’s address these areas separately and then we’ll bring them back together for some thoughts on how the game actually feels. There’s a fair amount of game contained in its small box. Players are competing to become members of the Extraordinary Guild of Traders by being the first to arrange their stall according to the Guild’s specifications. 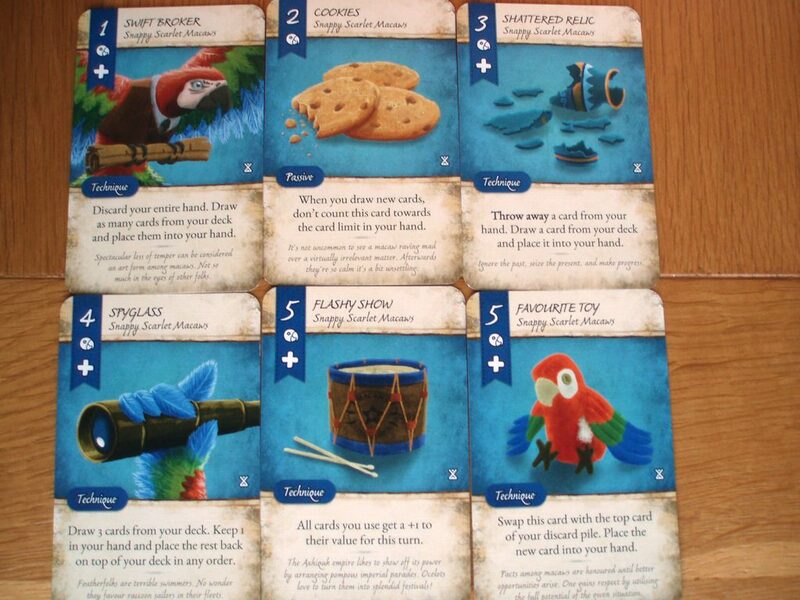 This makes Dale of Merchants a race: the first player to set out 8 stacks of goods (cards) in front of them wins. Each stack must be built of cards from your hand worth an increasing amount and from the same animal set. The first stack must be worth 1, the second 2 and so on until the final stack needs to be made up of cards worth a whopping 8. Once you’ve used a card to build a stack you can’t reuse it, meaning that the entire game revolves around deciding when to hang on to your cards for their effects and spending power, and when to sacrifice them to create the stacks you need to win. It’s as much deck-dismantling as it is deck-building. How will you achieve your stacks? Buy a card from the central market by spending cards from your hand. Spent cards are then placed in your discard pile and so cycle back through your deck in time. Play a card from your hand for its special effect. Some cards also provide a second action, enabling you to chain moves together like a market stall champion. Build a stack worth the next amount in your sequence and made up of cards from your hand of the same animal set. Discard as many cards from your hand as you’d like. Cards bought from the market go directly into your hand. Only the cards that you’ve actually played get discarded at the end of your turn. The small market means that cards filter through quickly, decreasing in price as they move down and making each purchase of interest to every player. Combined, these rules give players phenomenal control over their hands of cards. Normally in a deckbuilding game turns can be wasted when the random shuffle produces a hand of cards that just doesn’t work together. 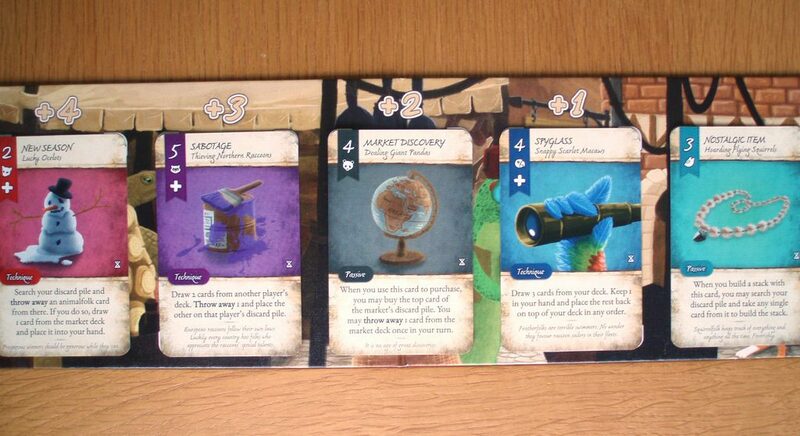 Dale of Merchants circumnavigates this issue by letting you hold onto cards that will be more useful later. It allows players to plan subsequent turns with confidence rather than hope. The decisions you make on every turn are interesting and challenging. When do you lose your cards to a stack? Should you buy cards based on animal deck, value or special ability? Is it worth hanging on to a particular card in your hand for a later turn? By forcing you to sacrifice cards to the stacks you aren’t crafting a deck of cards across the game. Instead your deck is kept small and nimble, it feels more fluid and reactive. I’ve played games where my hand of cards is my entire deck, all my options available and not stuck waiting for a particular card to emerge from the deck. The fact that it’s a race makes the game enjoyably tense. Every move a competitor makes is of interest, every stack built is another clear step ahead of you. The winner isn’t hiding behind obtuse points but sitting there with more stacks in front of them than you. This psychological aspect affects the question of when to build a stack. Now may not be the best time but it’ll make you feel better than remaining so clearly behind. Some of the card effects directly add to this interactivity so that you are playing the game with your friends and not just across from them. Unfortunately with so many different cards with their own effect text it can sometimes take a while to read and compare cards, but familiarity with the game and an available market of only 5 cards at a time helps to reduce this. With two players there’s a satisfying back and forth rhythm that propels the game along in a duel of wits. With four it’s busier, a bustling market of stall holders scrabbling for custom. All player counts are fun but it must be said that the two player game feels tighter: the game state changes less between your turns, allowing for more strategic planning. Each animal deck consists of 15 cards, ranging in worth from 1 to 5. The two cards worth 5 are different from each other whilst the remaining cards at each level are the same, providing 6 distinct card types. All this results in a game that feels close and personal. You aren’t battling grand armies or saving the world from cataclysm. You’re a market stall owner directly competing with your neighbouring hawkers. This relatable familiarity supports the setting. Whilst I’ve yet to play the other games set in this world (a standalone sequel and a campaign miniatures game), the thematic choices – displaying your wares on a market stall and peacekeeping – are an approach that subtly grounds the world, adding character without overdoing it. The theme is utterly charming. I can’t pretend that everything about the animal decks and the stacks makes sense to me – if I’m setting out my wares, why do they sometimes include animal-folk? Whilst most cards depict items, the lowest ranked cards are animals so are we selling ourselves? And if the concept is about being the best trader, why aren’t we actually trading anything? Minor thematic quibbles aside, it’s hard to fault Dale of Merchants. The artwork by Sami Laakso (who’s also the designer) is gorgeous and engaging. Each animal deck has its own theme that ties into how it plays, meaning that the feel of an individual game depends on what animal decks are in play. The game comes with 6 animal decks in the box, not a huge amount but with 6 individual card types per deck there’s a good amount of variation. The character of the game really comes through in the artwork. The Snappy Scarlet Macaws specialise in hand management, the Thieving Northern Racoons let you mess with your opponents, whilst the Hoarding Flying Squirrels enable you to manipulate the cards in your stacks. And I’ve not mentioned the Lucky Ocelots, Dealing Giant Pandas or Adapting Veiled Chameleons which each have their own specialisms. If you want more then the mini-expansion Systematic European Beavers are master planners, whilst the stand-alone sequel has another 6 animals including sloths, crocodiles and owls. The sloths are a perfect illustration of the thematic charm of this series – all their effects are delayed. Some games invent whole new genres. Others take something good and refine the concept; they strive towards being perfect examples of a genre. Dale of Merchants fits in this later camp. It revitalises an over-used mechanic and makes it its own. There’s a ton of ideas and charm crammed into its small box. Dale of Merchants won’t crack the Board Game Geek top 10 but its character and gameplay means that it’s easily broken into my personal favourites. Somehow that means more. Next postCarthage Review – Are You Not Entertained?